McDonald's is launching new chocolate-mint varieties of the Shamrock Shake for St. Patrick's Day. It's a good day for chocolate-loving leprechauns. This year, McDonald's St. Patrick's Day-themed Shamrock Shakes are coming in a variety of chocolate flavors, the fast food chain announced. 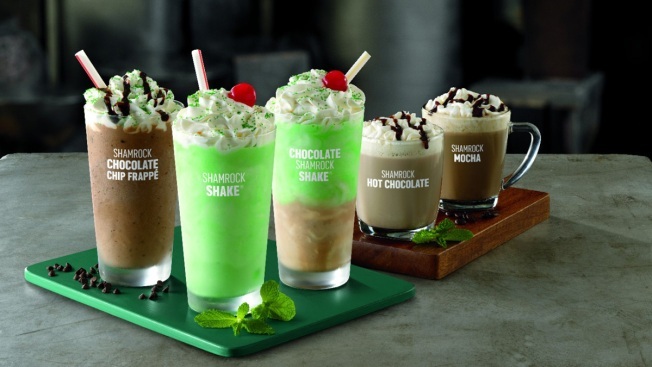 Along with the familiar, green Shamrock Shake, customers will find Chocolate Shamrock Shake (half mint, half chocolate), Shamrock Hot Chocolate, Shamrock Mocha and Shamrock Chocolate Chip Frappe on the menu. Each drink has at least a hint of mint. The Shamrock Shake was first released in 1970, and its sales helped build the first Ronald McDonald house, in Philadelphia, four years later.